If you’re craving sugar and you’re diabetic, I can understand how you feel. I’m not pointing fingers. I’ve single handedly devoured an entire box of Entenmann’s cookies in one sitting before because of cravings. When you’re craving something, sometimes the hardest thing to do is just say no. In my program Master Your Diabetes, I talk about this concept called your inner werewolf. This is where you hear the cookie or the sweet-thing calling your name. And this can go on for a long period of time. It can be so tempting. Well here I’m going to help you through this. Give you some techniques. But before I get to that… Here’s the thing. Sometimes the best thing to do when you have a craving for something, it’s like the old Nike slogan – Just Do it. Really. Sometimes it’s best to just eat it. I know, I know. Here I am supposed to be the diabetes expert and I’m telling you to send your blood sugars souring. I know… but hear me out. Drink a low-calorie beverage. For me my go-to is green tea. Maybe for you it might be coffee. The reason for this is this might help reduce your craving for the sugar. Keep snacks around that won’t send your blood sugar sky high. One great one is popcorn. You might find that by having popcorn might take your mind off of the craving and satisfy you. One resource that I’ve been trying out is the Choc Zero stuff. Not only are their products delicious, but they won’t send your blood sugar through the roof the same way a piece of cake might. The truth is, according to research, we make more than 250 food-related decisions on a daily basis. And when the holidays roll around… this number is even higher! Science and technology now allow us to substitute chemical sweeteners and artificial fats. Although, I recommend instead of artificial sweeteneres you opt for natural sweeteners such as Stevia or Monk fruit. These are natural herbal sweeteners that won’t spike your blood sugar and are sweet. 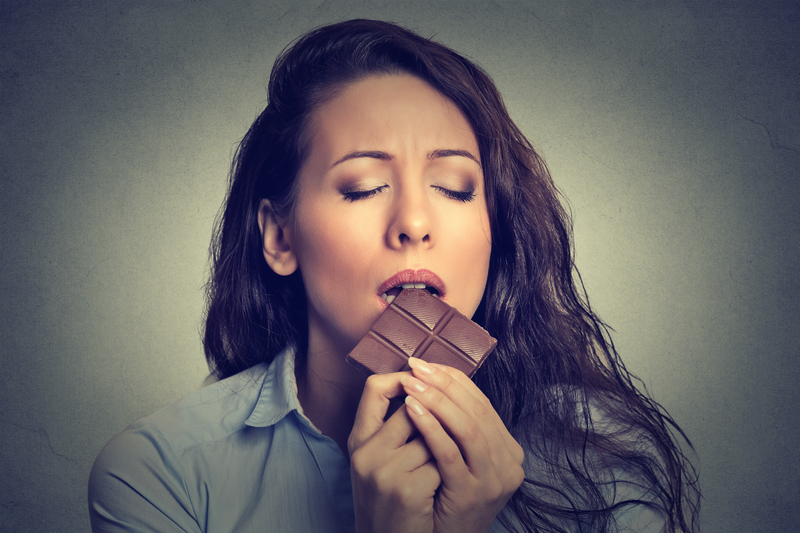 Slow down and try to let your brain register what you’re eating, even if it is a food your crave so that this way you’re more likely to not overindulge in the sweet-thing. Rate your hunger – ask yourself: am I hungry and if so for what? If could be that you’re really hungry or craving a meal that requires more effort to cook so you resort to the craving. Assess your food – Focus on how you feel after you’ve eaten. I’ve done this before and found that that crash after eating the sweet thing makes me think about it next time the craving comes up. Pay attention to what your body is telling you – focus on at what point you feel satisfied and no longer need what it is you crave. You might find that just by paying attention to this, you’re less likely to overdo it. You might even be good with a small portion of the thing you’re craving. Use good timing – having the food you’re craving with other macronutrients such as protein or healthy fats like avocado to reduce the blood sugar hit of let’s say the cake. Most importantly, I recommend testing your blood sugar after you have what it is you’re craving. Sometimes just the act of scheduling it helps. Whether you’re craving the sweet thing, or the bread, or maybe even something like milk… at the end of the day we’re all human and we don’t want to bring out that inner werewolf. Give some of these techniques a try and remember, sometimes savoring a small portion of ‘the sweet’ can help us land the plane and get back in control. In the meantime, try alternatives such as Choc Zero’s stuff or other snacks to ward off cravings in the future. And last but not least, remember cravings are normal.